Be Living Healthy or Unhealthy these are the Important things which depends upon daily taking Food. If we eat Healthy and Natural food which contains Nutrition’s keep us Healthy. if we may not keep this in mind and attracted to the Junk food leads us to attack of many deceases. In this Corporate world we’ve leading life with less Exercise and more Stress. The Specialists say that if we keep maintaining food bases on the situations and follow a healthy diet keeps us healthy. from the past 2 decades Type2 Diabetes creating waves in Human life. Many people are the victims of this decease. Hyper Tension and Heart Deceases are the another Major problems. The Studies which proves to control all these health issues with single food placed on top which is a Millet Sprout called ‘Quinoa’ A kind of Cereal. If we make a habit of eating ‘Quinoa’ in our daily food we can keep away all the deceases like Diabetes, Hyper Tension, Heart Deceases and Cancer. It can be consumed as a food in the form of different types of Salads and in the Combination of Vegetarian and Non Vegetarian Items. Let’s have a look on ‘Quinoa’ that why it is so Healthy and what kind of Nutrition’s it has…. It makes Body cells Active and Elastic. ‘Quinoa’ has high level of Iron which helps to increase the Red Blood Cells. those who are suffering from ANEMIA problem make a habit of taking ‘Quinoa’ for 3 – 4 weeks best results we can see. Sufficient levels of Iron in the body helps to make Active Oxygen Supply to all parts. Sufficient levels Oxygen supply to brain makes active functioning. Compared to all Sprouts ‘Quinoa’ has Fiber levels more than 2 times. which makes the moments in Intestine so soft and makes Free Digestion. The Fiber makes a control of Blood Circulation and Glucose Levels, Decreasing the levels of Cholesterol in blood makes the less chances to get heart deceases. if we taking the ‘Quinoa’ for a long time the Obesity problem also be reduced and keep away. Quinoa has high level of Proteins and 9 types of Amino Acids it has. Magnesium and Manganese etc. 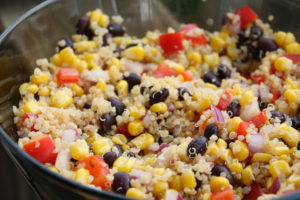 Micro Nutrients available sufficiently in ‘Quinoa’ helps to control and clear Type2 Diabetes. It makes Healthy functioning of nerve system and control body temperatures. It removes the body waste. It releases a high energy in the body and helps in Developing Strong bones and Tooth. The presence of Riboflavin(B) in the ‘Quinoa’ helps to co ordinate in between Brain, Muscles and the effective functioning of bio protecting System. Releases High Energy in Cells. The cereals we take in our food ‘Quinoa’ is the First one which has high levels of Manganese. Manganese Anti Oxidant which controls the Damage of Cells in the Body System and Protects Mitochondria in the Body. It helps to develop Red Blood cells and get rid from Wounds on body by developing Skin Cells in the Body.